In spite of Brexit (will it, won’t it, when, what difference will Brexit make anyway…?) people are still buying their dream homes in Greece. And what variety of homes there are! At the lower end of the market are village houses, economically priced apartments, or renovation projects. in the mid-level a variety of good family homes are on offer. At the higher end there are splendid villas, in all locations and styles for use for family holidays or as investment properties. Designs vary all over Greece. They include classic properties in the blue and white colours and clean lines of Santorini and Mykonos. Or the stone villas of Crete and Corfu, reflecting the traditional mountainside village houses. In every part of the country are unique properties of spectacular design and construction. They’re built to enhance their surroundings and show off the creativity of their architects. These properties tend to be built in the most stunning locations, either right on the sea shore or above the coast with fabulous views. Santorini, Mykonos and Paxos are certainly expensive – and with good reason, they’re utterly beautiful. Generally the smaller islands, where there is a price premium for the land plots, are more expensive. There are also amazing rural country estates and traditional manor houses, often set in many acres of grounds. A few of these historic properties have been sensitively renovated and are available for sale. Others are gently crumbling away until the right buyer comes along to rescue them. In Corfu in particular there is a trend towards low-key luxury. Many of the best villas are discreetly located amongst olive and cypress trees, or accessed down un-surfaced roads to discourage prying eyes. Every year we’re visited by numerous celebrities – film and pop stars, tycoons and royalty who arrive privately and prefer to live out of the public gaze. The recent UK TV series The Durrells has given Corfu additional publicity and the island’s links to Edward Lear, Lawrence Durrell and Henry Miller are an attraction for some. Prices for top-end properties range from €500,000 to well over €10,000,000. Buyers come from all over the world, drawn by the natural beauty of Greece, its excellent transport links, a multi-lingual local society, and of course the famous, unlimited Greek hospitality. The current “golden visa”, offering a Schengen visa for property investment, is an added incentive for many nationals of non-EU countries. 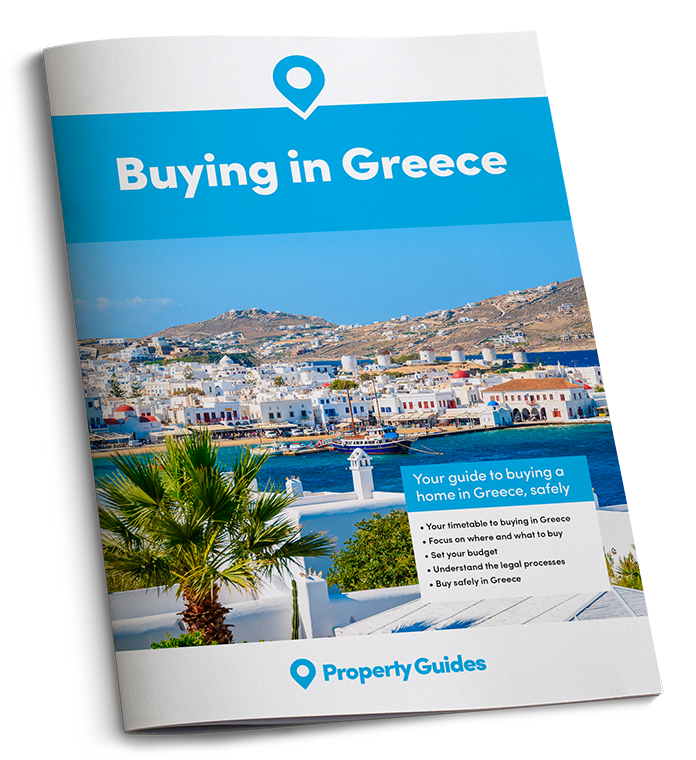 Download your Negotiation Guide to find out how to get the best possible Greek property for your budget. Like all property in Greece, prices at the upper reaches of the market were hit by the financial crisis. But while prices in places like Athens have fallen considerably, at the upper end and in the best locations a reduction of maybe 5% is more likely. In any case it is hard to be entirely certain on data, as figures are far less easy to find than in prime parts of London, for example. Each property is completely unique so there aren’t direct comparisons. Offers tend to be gauged individually, but certainly some vendors are willing to negotiate. Ar Corfu Homefinders we get requests of all sorts, especially properties with jetties or beachfront. You do need to be careful though, or you could buy a property with direct sea access on the west coast of Corfu, for example, but the sea is generally rougher on that side and it isn’t always safe to moor there. Beachfront properties definitely carry a price premium but theres no formula to calculate it. 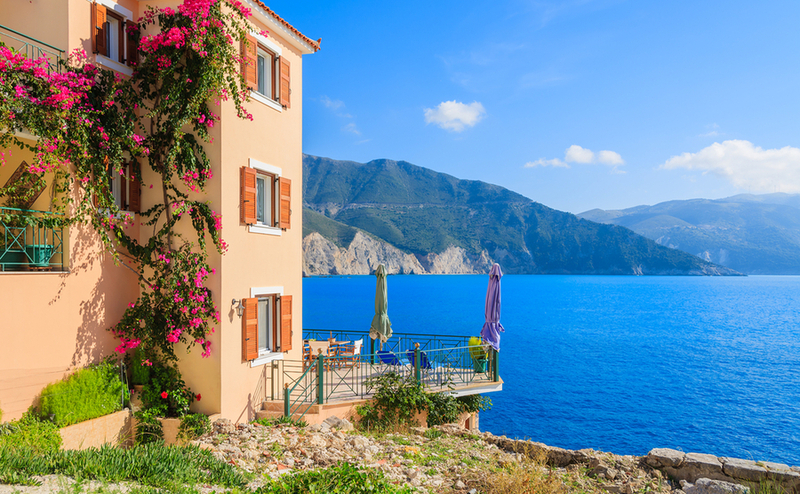 Corfu has its fair share of up market properties, and as estate agents we are naturally thrilled at the opportunity to offer some of them for sale. They give a an indication of the kind of choice. At the modern end of the spectrum we are currently marketing a contemporary stone villa near the sea in Nissaki. It’s entirely built from natural stone excavated from the land on which it is built. It has a double height living room with minstrels’ gallery and features a spiral staircase to a library. Furnished in Mediterranean style using pastel tones, with a natural rocky garden, pool and the obligatory full-on sea view it is on the market for €3,250,000. Another one is an ultra-modern ‘state of the art’ villa with views to the international marina. This one has marble and onyx bathrooms and floor tiles and floor to ceiling windows. It also has three guest or staff apartments and extensive garaging. All for sale at €1,700,000. We also have a modern house with direct access onto a gorgeous sandy beach in the south of the island. 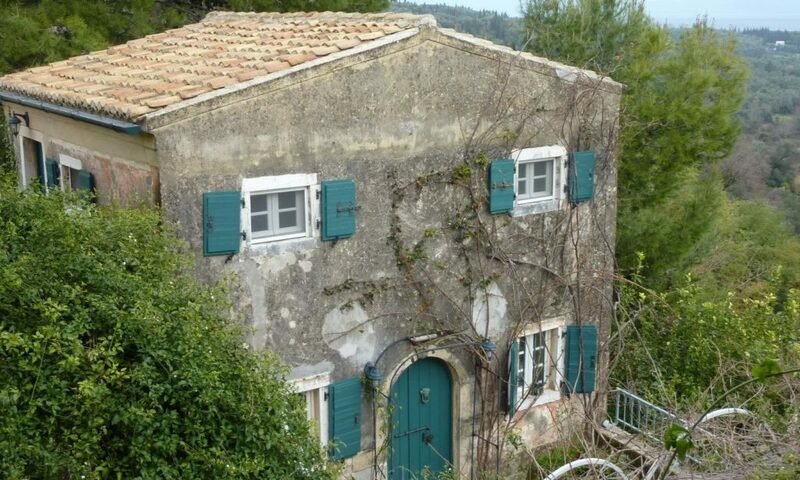 Prices tend to be slightly lower here and it is for sale at €950,000. When transferring large sums to buy property in Greece, you are exposing your hard-saved money to the vagaries of the currency markets. Learn how to protect your budget by locking in an exchange rate in the Property Buyer’s Guide to Currency. You have even more distant sea views with a property we have on sale for €2,900,000. This is a fully restored manor house in north of the island, with olive groves and views over the village roof tops. The seller has used reclaimed and recycled materials wherever possible and it comes with a huge parcel of land which can be further developed. We have an old olive press in the hills above the north coast too. This has been sympathetically renovated by its artist owner. It has a Mediterranean garden, with pool and lovely views towards the sunset. Very much a family home, there is also a separate guest cottage at present used as a working studio. All that for €2,500,000. This is just a small selection of what is on offer, on just one of Greece’s islands. Along with the high-end properties comes high-end service, with requests for services for private jets, helicopters, private water taxis, chefs, housekeeping staff, as well as a full range of maintenance staff. We are happy to help with all these.